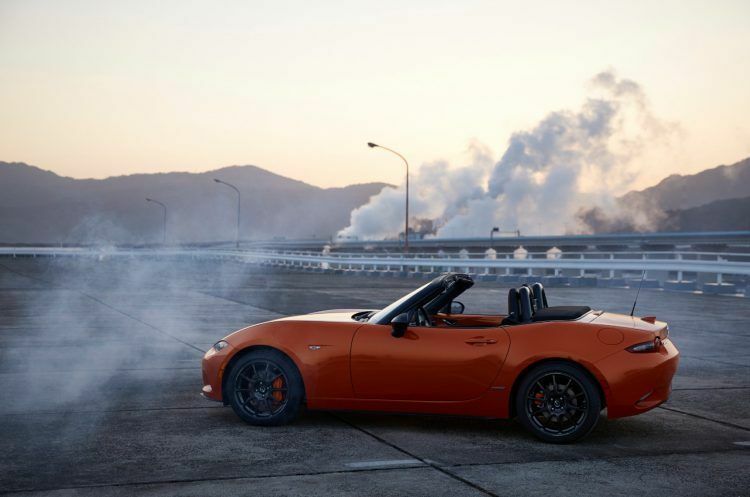 The Mazda MX-5 Miata 30th Anniversary edition pays homage to the car’s legacy. Unique and exclusive features include Racing Orange paint and special serial number badging. 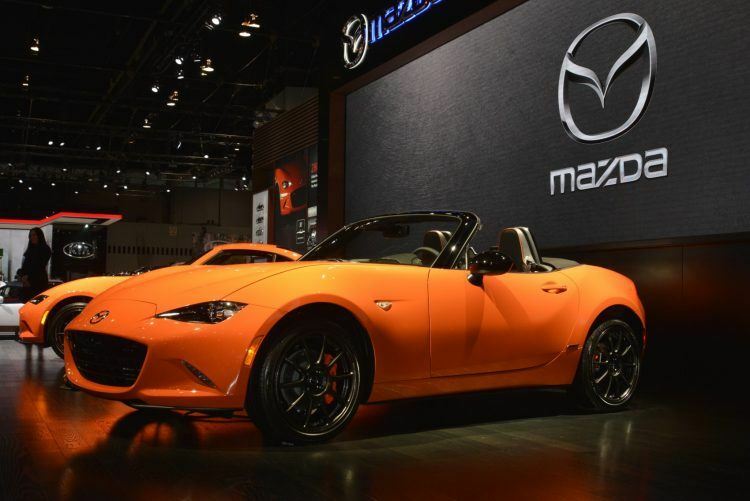 Mazda dropped the 30th Anniversary edition Miata at the 2019 Chicago Auto Show recently. It was, after all, at the 1989 Chicago Auto Show when the Miata first graced the world. Despite all the expected amazement that these little guys have been around since the USSR was a thing, the Miata is still the best bang for your buck. Speaking of bucks, Mazda also let us know how much a new MX-5 is going to cost. In the service of fairness, openness, and transparency, let me just state on record (again) that I am totally biased in favor of Mazda Miatas. I’ve owned one for decades now and, unhesitatingly and truthfully say they are the best British car I’ve ever owned. There, now that we’ve dispensed with that, what do we have with the 2019 Mazda MX-5 Miata 30th Anniversary edition? Related: Fabulous and fun: Our full review of the 2019 Mazda MX-5 Miata RF. Mazda MX-5 Miata 30th Anniversary edition on display at the 2019 Chicago Auto Show. The most obvious thing about the 30AE is the color: Orange. Now, orange isn’t a bad color, just a tricky color. It’s sort of like yellow, hard to get right, easy to get wrong. Mazda, with this Racing Orange paint job, gets it right on the 30th Anniversary Miata. It’s neither glaring nor too brownish. If you like orange in general (and I know some of you do), then you won’t mind getting a 30th Anniversary Miata because of the color. 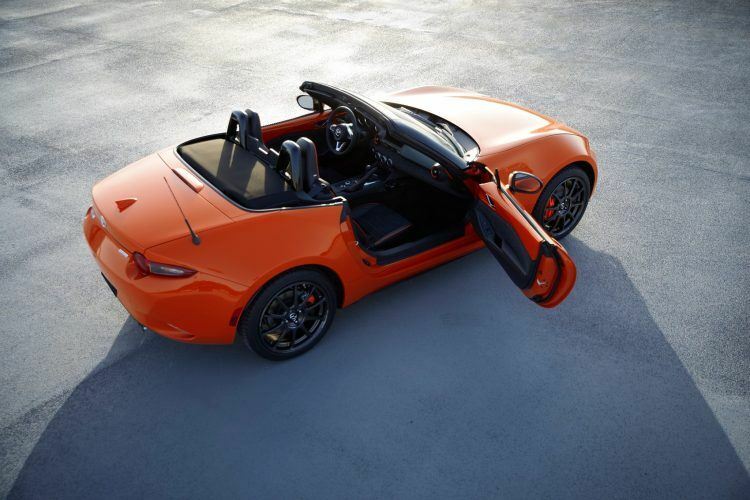 The 30th Anniversary Miata comes in both soft top and RF configurations; the RF being that odd, yet workable retractable hardtop/targa top arrangement that is as striking as it is practical. The roof on the RF is in matching Racing Orange, while the soft top comes in black cloth. There’s orange on the inside too, with orange interior louvers and orange piping on the heated RECARO sport seats. Ah yes, heated seats. It seems like excessive hedonism, until you’ve dropped the top on a brisk October morning. Then you realize heated seats are a minor miracle. Mazda says the RAYS ZE40 17-inch Dark Gunmetal forged-alloy wheels celebrate the Miata’s racing history. Photo: Mazda North American Operations. This is not a bare bones minimalist sports car of yore, no it is not. Standard on the 30th Anniversary Miata are things like Apple CarPlay and Android Auto – naturally, since seemingly every car these days comes with those. Also standard is SiriusXM with a three-month subscription, along with SiriusXM Traffic Plus and Travel Link complimentary subscriptions. All seem rather handy and enjoyable, if you don’t mind subscribing to yet another service in your life. The special edition Miatas are wrapped in Alcantara leather (nice), which is also found along the door inserts and lower instrument panel (also nice). Like all other Gen 4 Miatas, the 30AE is powered by the SKYACTIV-G 2.0-liter four-banger, cranking out a healthy 181 horsepower and 151 lb-ft. of torque. That’s a 17 percent increase over the prior generation. Given that the Gen 4 Miata has only gained around 300 lbs. over the first go round – meaning it tips the scales at around 2,400 lbs. today – 181 ponies are enough. Or a great start, if you’re one of those modifying fools/good friends of mine. Related: Could the Miata outpace one of history’s top muscle cars? Mazda has a tendency to gouge you on their special editions, but this time around, it’s not really all that bad. The manual soft tops run around $35,000 (about $500 more for the automatic) and the RFs are $37,000 to $38,000 depending on if you want the automatic or not. Only 3,000 are being made worldwide. And I read on a Miata forum last night they’ve already sold out. ARGH!